Jorgy is an unembellished look at Alaskan Aviation through the eyes and actual words of Holger Jorgensen, one of Alaska's most respected pilots. It takes the reader through the ending days of the Nome Gold Rush to the coming of the jet age. 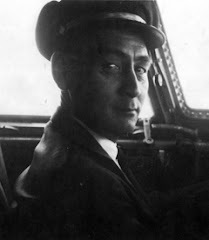 If you are an aviation enthusiast, a history buff, or you'd just like to meet an amazing Alaskan Eskimo Pilot who touched many, many lives, this is a must for you! ... Jorgy traces his rough beginning in the gold mines to the left seat of jets and turboprops, flying all over the world. Don't expect him to pull punches or mince words. That wouldn't be Holger. For example: suffering macular degeneration late in his life, he talks of flying blind (in more ways than one) on his last flight, a tale that would curl the hair of an FAA inspector. Good thing there's a statute of limitations! 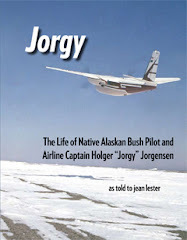 Jorgy's life story follows the coming of age of commercial aviation in America's flyingest state, Alaska. Holger Jorgensen's leadership and mentoring changed Alaskan aviation and the lives of those he touched for the better, and forever. I heartily recommend this excellent book. A new review on Amazon is titled "What is really exciting about Alaska:"
Back when I traveled the world while home schooling several kids, when we landed into a new country, we learned to head to the local library (or it's equivalent) for advice. "What are the stories about this place we need to read? What will orient us to this country, its landscapes and and weathers, the people who have lived here long and ones who have come lately? What stories do you recommend?" "Jorgy" is just such a keeper. The story begins with his hybrid parentage, Eskimo mother and Norwegian gold miner father, and the challenges of village life on Alaska's Seward Peninsula prior to World War II. Rich in details about kid's games, schooling, methods of hauling water and wood, hunting, fishing, and mining work, we also get to see the prejudice he experienced from both cultural wings of his heritage and the effect of his mother's remarkable work in independently raising five children after his dad's death in a mining accident. Jean Lester does a remarkable writing job throughout--her perfect invisibility --allows us to simply listen to Jorgy's unfolding story. From the glamor-and risks- of early aviation, wartime changes and post war possibilities via the GI bill, at each step, we see this young village kid making step by step choices into an extraordinary life. Hollywood would be hard pressed to match the appealing glamour we see in many of the photos of Jorgy, his wife, family and of course the many handsome airplanes, but there is grit throughout which underscores the inherent drama of early bush and commercial flying.